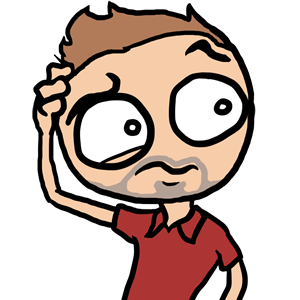 Choosing the right TEFL course can be confusing! Do you go for the well known Cambridge CELTA certificate? Or consider an alternative like the Trinity CertTESOL? And what exactly is the difference between them anyway? In this help guide, we’ll explore the difference between CELTA and CertTESOL to give you everything you need to know about both courses. How can you trust the information in this guide? You know that I studied the CELTA and run a website dedicated to helping people prepare for their CELTA, so I have an obvious bias based on my own experience. That’s unavoidable but natural. However, I will always be as fair as possible and provide unbiased information, because my aim is to help you to make an informed choice. If the TrinityTESOL is best for your situation, you should definitely consider it. 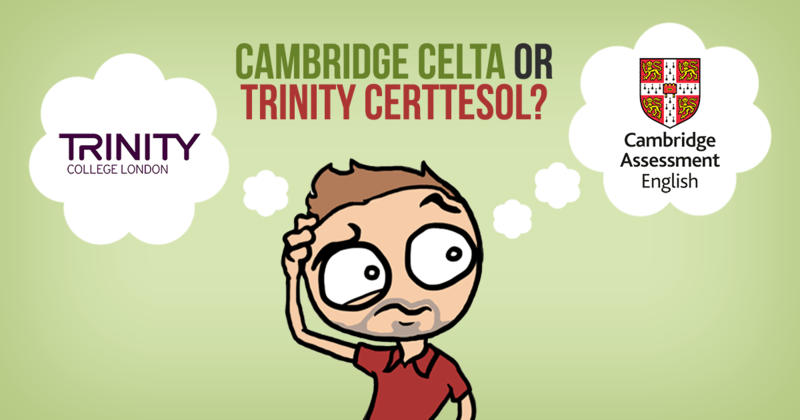 This CELTA vs. TrinityTESOL comparison guide is based on research and facts. My team researched both courses by emailing course providers and schools, reading through applications and syllabuses, and checking credible websites. Who are the accrediting organisations for each course? Both institutions are highly respected. Trinity college is an international exam board for performing arts and English. 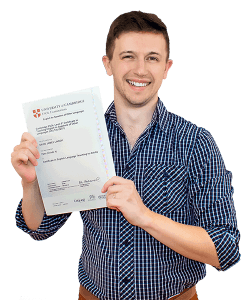 Cambridge English Language Assessment is part of Cambridge University, which is obviously a highly regarded university. In some people’s eyes this may lend the CELTA more credibility. What are the benefits of each certificate? You get a Level 5 qualification enabling you to teach English internationally. CELTA is a more recognisable ‘brand’ and has the weight of Cambridge behind it, which may be more highly regarded internationally. Much more widely available with a good choice of training providers and locations. There is more help and preparation available on the internet and in books, due to the greater popularity of the course. There a 3 levels of pass grade available — Pass, Pass B and Pass A — as opposed to just one. It leads into more advanced courses such as DELTA which is diploma level. Some training providers offer the CertTESOL at a slightly reduced price, compared to the CELTA. May be available in a more convenient location for you. It leads into more advanced courses such as DipTESOL which is diploma level. Firstly, it’s important to say that both CELTA and CertTESOL are excellent, high-quality TEFL courses. They both provide the same level of qualification, similar syllabuses, and the opportunity to upgrade to an equally recognised diploma level certificate after a few years experience. The main thing that separates the two courses is ‘recognisability’. There’s little doubt, that of the two, the Cambridge CELTA qualification is the more famous. It has been marketed more effectively and is known by every language school that teaches English in the world. This means there is the implied benefit of the CELTA leading to more job opportunities. If two applicants apply for a job, and the only thing that separates them is a CELTA vs. CertTESOL, then, rightly or wrongly, the CELTA may be seen as a less risky hire. People feel more comfortable with familiarity, even directors at international schools. Be competent in written and spoken English, to an appropriate level for a teacher of English language skills (Non-native English speakers should be assessed equally at interview for most training providers). Both courses have rigid age limits and expect a decent standard of education. But they are both fairly flexible in the level of English required for the job. They realise that not everybody applying will be native speakers, but they do expect a degree of fluency. If you are a non-native speaker, you’ll need a level C1 or C2. The CertTESOL providers (aka centres or schools) may add additional requirements, such as slightly higher age limits, so be sure to check with them directly. How internationally recognised is the course? A well-known brand that is recognised globally by international schools and colleges. Affiliated with Cambridge University, which is a highly regarded institution around the world. Becoming more recognisable due to increased marketing and more training providers offering the course. Still less recognisable than the CELTA. Recognisability is a recurring theme in this article. This is really the crux of the matter. As you’ll see in a moment, there isn’t that much difference in terms of content and assessment. The real difference lies in the public perception of each course, where the CELTA definitely wins out. “[CertTESOL] is recognised as a qualification for English language teaching in the UK and internationally. It is regulated by Ofqual, the statutory body authorised to regulate qualifications in this field in England, and the (former) British Association of TESOL Qualifying Institutions in establishing a national framework of specifications. There is some variability between training centres and geographic locations, so it’s worth shopping around. The CertTESOL does appear to be a little bit cheaper in certain areas. Intensive – 4 week course – minimum of 120 hours. Part-time – the same course as above, spread out over 12-16 weeks or more. Blended learning – both online and onsite elements. Lesson planning, written assignments and input sessions can be done at home, but teaching practice and lesson observations require you to attend a CELTA centre. Intensive – 4 week course – minimum of 130 hours. Blended learning – both online and onsite elements. Lesson planning, written assignments and input sessions can be done at home, but teaching practice and lesson observations require you to attend a CertTESOL centre. Both courses offer the same selection of study options, with little difference in duration or cost. Over 100 approved centres worldwide. Both courses are offered in locations around the globe, as you would expect from TEFL courses. However, there’s a wider choice if you decide to study for the CELTA as there are three times as many training centres or schools. What content is covered in each course? Both courses cover similar content. CertTESOL has some content related to teaching young learners (though all teaching practice is with adults), there is slightly more emphasis on phonology and there is also a project based on teaching one to one classes. Both syllabuses are very similar in terms of content and structure: it’s likely they both draw inspiration from each other to ensure their courses are competitive and comprehensive. Having studied the CELTA syllabus (both during my course and to create this website for you), I’ve come to have a deeper appreciation of how each module helps new teachers as they start their career. If the Trinity CertTESOL syllabus is built with the same care and aims, then it should be equally as useful. Thumbs up for both course providers here! How are the course hours divided up? Full-time or Part-time CertTESOL – 90 hours supervised input (tutorials/workshops), 10 hours teaching practice and 30 hours preparation time. Blended Learning CertTESOL (Online) – 100 hours online, 20 hours face to face, 10 hours teaching practice. The number of hours vary depending on the training centre, especially for the online courses. Please use these as a rough guide only. Both CELTA and CertTESOL are the real deal in term of hours. That’s sign of a quality certificate designed to help you improve. Shorter courses may offer value if you understand what you’re getting, but only the 120+ hour CELTA and CertTESOL are suitable for new teachers entering the TEFL industry. Tutors provide continuous assessment throughout the course in two main areas: Teaching Practice and Written Assignments. Cambridge external assessor moderates each course as a whole. Teaching practice and assignment components have to be passed in order to be awarded the certificate. Three distinct pass grades: Pass, Pass B and Pass A. Units 1, 2, 3 and 5 are assessed by your tutor. Unit 4 will be assessed by an external moderator from Trinity college. All units must be passed to be awarded the certificate. No grades; you’re awarded either a Pass or a Fail. Both courses are rigorously assessed. The moderation process makes sure that all training providers are assessing to a standardised level and that the quality of instruction is high. Again, both courses appear equal in terms of the method and quality of assessment. How many employers ask for CELTA vs. CertTESOL? Most of this guide is based on research we’ve found on websites and by emailing course centres. But are the CELTA and CertTESOL perceived differently in the real world of job vacancies? My team and I carried out a simple experiment to understand whether TEFL employers prefer CELTA or CertTESOL when listing their desired qualifications. We took a sample of 30 job vacancies posted online, selected randomly from various job listing websites, and recorded whether they asked for CELTA, CertTESOL, either or general TEFL certificate. Although these results are over a small sample size, it’s clear that CELTA is specifically requested more often than CertTESOL. Whether this is due to a simple lack of awareness of the CertTESOL qualification or that the CELTA is valued more highly, it’s difficult to tell. After reading through the above comparisons, it’s clear that there really isn’t that much difference between the CELTA and CertTESOL, especially not in terms of course content and syllabus. Trinity CertTESOL is a highly respected and recognised certificate. I believe it’s a credible alternative to the Cambridge CELTA, and more options are great; it encourages course providers to constantly improve syllabus content and remain competitively priced. However, the CELTA is a more recognisable name in the TEFL world. The amount of times it was the only qualification mentioned in the job listings proves that. This big gulf in awareness means that I personally advise taking the CELTA over the CertTESOL. That’s the course I took and I can attest to how useful it has been in developing my professional teaching career. Having said that, Trinity CertTESOL is currently the only full alternative to CELTA that I would recommend as a worthwhile path to entering the TEFL industry, as it is the second most recognisable certificate available. For some people, it may be offered at a more convenient date or location; in which case it should be a definite consideration. I hope I’ve provided a balanced and useful comparison between CELTA and Trinity CertTESOL. I’d love to hear from you in the comments below, especially if you can share any direct experience with CertTESOL. Want to check our research sources? We put a lot of research into this guide to be sure it was a fair and unbiased comparison. Someone is sure to ask, “How can I be sure this is an unbiased comparison?” If you’re interested, here are just some of the many sources we used. Trinity - How many CertTESOL courses each year? "Over 600 courses are run worldwide each year, either full time or part time." Very useful article. I have chosen the CELTA training and must say that I’m pleased with my decision. Thank you for such an informative guide. Thanks Véronique, good luck with your course. Drop by and let us know how it goes for you. Would like to join the course. Please send me enrollment details. Certainly it’s useful information. Tremendous thanks to Pass the CELTA to provide the solid information in between 2 programmes. Thanks for a comprehensive comparison but the Trinity course is not an option for me since they have no training centers in NY. As a matter of fact, they have none in the US (according to their map), the closest one is in Canada. why CELTA course is overpriced such as here in Egypt is more than 20000 Egyptian pound ? 20,000 EGP is about 820 GBP. That isn’t overpriced for the CELTA. Good job you are not doing statistical analysis your numbers add up to 27 of 30, therefore we must assume a +/-10% or that 10% required neither. Thanks for what was insightful information. Over here in Australia, they are pushing CELTA or their own Diploma in TESOL, which requires a BA to undertake as an admissions stipulation. In either case it is costing AU$3600 or 2000GBP or US$2550 ouch! You made me double-check… it definitely adds up to 30. Maybe the final 4 didn’t load on your screen. Yes, AU prices are definitely steep! I’m working on a full price comparison article which should be published soon, so we can all compare countries and regions. CELTA is required for most English language teaching jobs, often even in state schools which also require a degree (and perhaps an entry-level teaching certificate like PGCE in the UK).